Many directors of Shakespeare films have not been great film innovators and stylists—they've been stage directors with a deep understanding of the plays. That combination is enough to produce a great Shakespeare movie. But there's another group of directors who have both a deep understanding of the plays and who are also great film stylists and innovators. At the summit of that group are two directors: Orson Welles and Akira Kurosawa. Welles had directed most of Shakespeare's history plays by the time he was fifteen, and he reread the plays throughout his life. His three feature-length Shakespeare films may be the best things he ever did. He thought, and I agree, that his greatest film wasn't Citizen Kane but The Chimes at Midnight, his mash-up of the Henry plays. Similarly, Kurosawa's appreciation of Shakespeare began early, when he was an art student, and continued throughout his life. Three of his best films are versions of Shakespeare plays. The Bad Sleep Well loosely follows Hamlet, resetting it in postwar Japan. Ran ("Chaos") is an adaptation of King Lear set in sixteenth-century Japan. And Throne of Blood is a Macbeth adaptation, also set in feudal Japan, that follows Shakespeare more closely than either of the other two films. Still, Throne of Blood changes Macbeth in a number of ways. Most important, Kurosawa's Washizu is not as evil as Macbeth, and his Lady Asaji is more evil than Lady Macbeth. First, Lady Asaji manipulates her husband into murdering the Great Lord (Duncan) by saying that Miki (Banquo) might reveal the prophecy that Washizu will become Lord of Spiderweb Castle. If the present lord hears this, he'll consider Washizu a potential usurper and have him killed. Washizu launches a preemptive strike, killing the Great Lord in part to keep himself from being killed. His defensive action differs dramatically from Macbeth's killing Duncan out of sheer ambition. Second, Shakespeare's Macbeth decides on his own to kill Banquo and Fleance; he keeps his exact plans secret from his wife, saying, "Be innocent of the knowledge, dearest chuck, / Till thou applaud the deed." In Throne of Blood, far from wanting to kill the Fleance character, Washizu wants to name him his heir. He and Lady Asaji don't have any children, and Washizu wants to reward the Miki's loyalty. Lady Asaji talks Washizu out of this plan in words that echo Macbeth's soliloquy at the beginning of act three: "To be thus is nothing / But to be safely thus." She finally encourages Washizu to kill Miki by saying that she's pregnant, that their own son could become the Great Lord. Washizu is thus manipulated into murdering his friend, rather than coming up with the idea on his own. 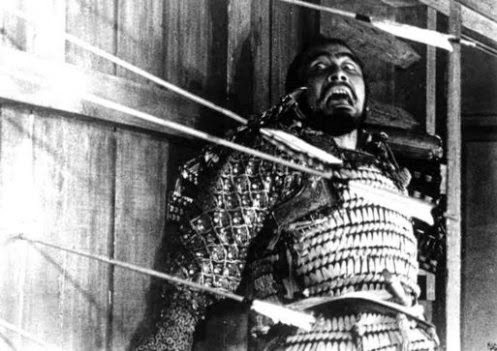 Kurosawa's overall idea of the character is reflected in the title of his film, which in Japanese means not Throne of Blood but Spiderweb Castle. Spiderweb images occur throughout the movie: in the bare trees in Spiderweb Forest, in the spinning of the "evil spirit," and in the web of arrows that surrounds Washizu at the end of the film. These images point to Kurosawa's sense of the main character as a man caught in a web woven by others, rather than a man who, tempted by others, weaves his own web. Kurosawa was a genius creating this film, especially with the technology available at the time. The Evil spirits laugh scared me! And I'm so easy to scare. Anyways, a few things I noticed about the Spiderweb forest includes the pictures and filming of the characters seeming as if their caught in tree branches, or twigs; resembling a spider web. Most of these scenes happened in the forest. It was almost as if each time Washizu would explore the forest, he was getting deeper and deeper in the "spider's web" and being caught up in knowing his future, and never cared about living his life the way it was meant to be. Washizu was a power-hungry man who would do anything in order to continue ruling. His wife may actually have wanted more power then Washizu! She convinced him on multiple occasions to do something he did not want. She wanted the best, and she got it, but she went insane. Kurosawa never showed that she committed suicide unlike the original play in which Lady Macbeth does "pull the plug" on herself. I thought this movie was very well done with what they had available to use. Discussing the "spiderwebs" it seems as though the though the characters portrayed the spider webs as well during the scenes in the forest. As you got deeper into the forest the harder it was to escape "the spider web". You see that a lot with Washizu. Overall this movie was excellent and well filmed. As far as the story of Macbeth goes Kurosawa did an excellent job of portraying it while being able to mix in Japanese culture. Washizu shared the same characteristics and struggles of Macbeth such as the pressure from his wife to murder the king and his overconfidence of the "victory" he's going to have over the attacking army. I've never been a huge fan of Japanese films but I can definitely see why this one is considered to be a great film. I loved the movie. I loved the intensity of being trapped inside of a never-ending web. I didn't like the intro however because it was just listening to messengers. Being an audience member and just hearing of these brave men fighting these battles with no one scenarios just makes me wish I was watching the battle instead of this movie. The movie was well filmed and I'd like to see a modern remake with colors and effects. It was very interesting to see an interpretation of Shakespeare's work from a director coming from such a different cultural perspective. I also noticed the differences in the characters that were explained more fully in the brief at the top of this page. I did feel that Macbeth was more innocent and Lady Macbeth more evil in the film, especially compared to the written version. The written work makes Macbeth's ambition the main motivation of the character, while the film felt differently. I wonder if the cultural background in Japan is part of this director's different perspectives. I found Akira Kurosawa's rendition of this play was remarkable however very strange compared to the ideals of my more "american" taste pallet. I found there to be much more imagery in this story compared to action and gripping battle scenes of a stereotypical american film. In this film I really enjoyed how the some of the characters deceived one another to try and get what they wanted. It was a pretty excellent rendition of Macbeth and how he planned to keep his killings to himself and not tell his wife anything. The foreign language was a little hard to keep up with but over all great. Though most foreign films are not my thing, for lack of understanding throughout the film, these films were done very well and thoroughly enjoyed. I thought Throne of Blood was a very interesting interpretation of Macbeth, especially with the adaptions made by Lady Macbeth and Macbeth himself. Seeing one cultures interpretation of another’s work is always interesting. I though that overall the film did a great job at portraying the play in a different setting and time. However I found the ending to be wrapped up rather fast wt the arrow death scene. Opposed to Polanski's Mac Beth where the spider web collapsed much slower, when he did discover that the witches predictions were actually coming true. I felt that their was a stronger emotion behind the Death of Macbeth by Mac duff in polanski's version too. In this movie due to the arrows being shot at him rapidly it was hard to tell who killed him exactly. I felt that this left out one of the most important emotional revenge plots of the story. I feel that this is an important pat in Mac Beth too because it helps bring a deeper meaning behind the collapse of Macbeth. Although I typically don't enjoy foreign films, there were a few elements of this one that I did like. I really tried to pay attention to the "web" theme throughout the movie. I think most of the spiderweb scenes take place in the forest, beginning with their disorientation and the evil spirit. However, it was also very clear that Washizu was trapped in his own mind, as was his wife at the end of the movie. The switch of his wife was interesting...she went from advocating the murder to feeling extreme guilt afterwards. Considering it was an older film, I thought Kurosawa did a good job of manipulating Shakespearean events and translating them into a Japanese setting. Comparing the original version of Macbeth to Kurosawa "Throne of Blood"version, I found the Japanese culture mixed in great with the film. Kurosawa definitely has his own way of directing and filming which was nice to see and compare to other versions of Shakespeare's films. The spider webs in the film actually caught my eye and its now going back to reflect on the scenes of the play its amazing how little details can mean so much. Watching the movie in Japanese was kind of difficult, I appreciate the cultural differences when comparing the film to the English version, but the long pauses in the film and the rapid flow of the characters talking in a different language made it difficult to keep up with the film. Overall I can say the film was a good change from what we are use too. It was interesting to see a Shakespeare based film with a different cultural interpretation. It is very good to have different cultures putting their perspective on plays because it makes Shakespeare more accessible, and it allows us to learn about cultures at the same time. I think Kurosawa's Throne of Blood was a very interesting blend of Shakespeare and the Japanese culture to make a great movie. The mixture of Shakespeare's Macbeth and the Japanese style kept me on my toes and was a very different experience. I really enjoyed the imagery that was placed throughout the movie and the recurrence of spider webs and the meaning behind them was very meaningful. I was surprised by how much i enjoyed this film. What i found particularly interesting as far as the spider web are concerned was the way Washizu's wife behaves in early part of the movie. She walks around him in a deliberate and careful way similar to how a spider weaves a web, and its as if this web is the same one that entangles both of them. When this movie began i thought that it was going to be difficult to follow because of the language barrier. I am not sure if the director had this in mind, but the way that all of the scenes were filmed made it easy to follow even if you could not read the sub titles. I also really enjoyed the film because it gave another perspective and twist of plot to make you think more about the original Shakespeare play. This film maker/director really embraced imagery and various themes that made the play visual understandable. Over all i really enjoyed the film. I think that Kurosawa did a great job making Throne of Blood. I really like the way that he altered the plot to make the MacBeth character seem more like a victim caught up in a web of lies and deceit. I definitely preferred the idea of having his wife really being the one behind the scenes running the show. I found the seen with the witch particularly interesting. While Washizu was talking to her, the witch was spin a strand of silk. It just shows how the witch was creating the web that was going to snare Washizu. Plus the last scene with the arrows was awesome! If you watch it again, it looks like Washizu was struggling like a fly in a spider wed. It was so cool, haha! !